Having already been trialled by Royal Mail, these will enter service in December. They were produced by Oxfordshire-based carmaker Arrival, formerly known as Charge Auto, built the trucks at their new 110,000 sqft factory in Banbury. The vehicles, which come in various sizes, will distribute post from the central London depot. Arrival says the vehicles come in various sizes, 3.5, 6 and 7.5 tonne trucks. Although the current prototype versions are fitted with wing mirrors, a spokeswoman for Arrival say they will be replaced with cameras will be used to monitor traffic to the rear instead. Royal Mail was "delighted" to be collaborating with Arrival, said Paul Gatti, Royal Mail Fleet's managing director. "We will be putting them through their paces over the next several months to see how they cope with the mail collection demands from our larger sites," he added. 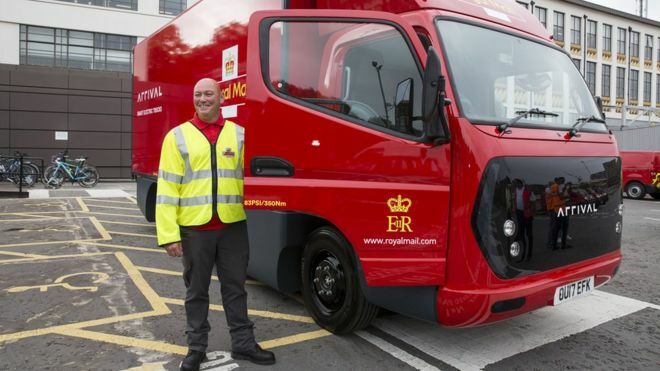 Royal Mail's fleet comprises about 49,000 vehicles in total.